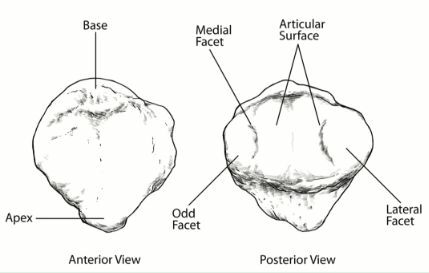 In an earlier article (see How to Please the Knees in Low Lunge and Pigeon), we discovered that the kneecap (patella) has a teardrop shape (see figure 1 below) and it glides up and down a groove found at the end of the thighbone (femur). The underside of the patella, the part that contacts the femur, has a layer of slippery cartilage (called articular cartilage), as do the edges of the groove in the femur. As the knee bends, the patella first starts off high on the femur, not touching the groove at all; with more flexion, it starts to dive deeper, until eventually it has maximum contact with the groove. FIGURE 1: Front (anterior) and back (posterior) views of an average-looking kneecap. FIGURE 2: The kneecap slides and glides: (a) in hyperextension of –10°, the patella is pulled up high on the distal femur; (b) in full extension, it sits slightly above the femoral condyles (the rounded ends of the femur), but not as high as it does in hyperextension; (c) with 20° of flexion, the patella is now contacting the femoral condyles; (d) at 90° of flexion, the superior portion of the patella is in contact with the condylar groove; (e) at 135° of flexion, the patella is sitting well embedded in the groove. 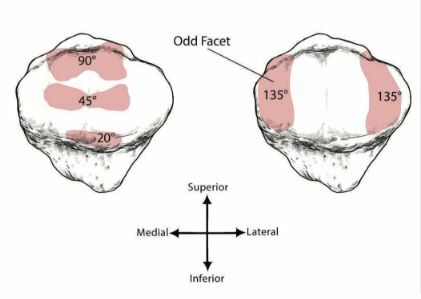 The patella’s thickness ranges between 2 to 3 cm—not including the articular cartilage which is some of the thickest cartilage in the body—and these variations in thickness determine the shape of the underside of the patella. We are all unique, and so too are these shapes. Figure 3 shows these different shapes, both in the patella and in the valley within which the patella moves. Normally, the high outer edge (the lateral side) of the groove keeps the patella inside the valley. In some cases, however, the two shapes do not allow for a nice confinement of the patella to the patellar groove, and this can lead to instability in the knee, dislocation of the kneecap, and patellofemoral pain. 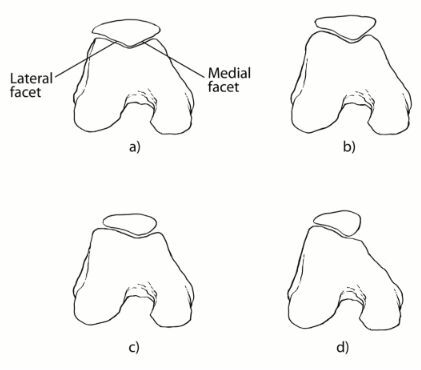 FIGURE 3: Variations in the cross-section of the patella and the femoral groove. The irregular shape of the underside of the patella is important for another reason, especially when we consider how much of a knee bend we should seek in a variety of yoga poses. Figure 1 shows the underside of the patella (posterior view). Figure 2 shows that, as the patella glides down into the groove of the femur, not all of it is in full contact with the femur. How much of the patella is contacting the femur is shown in figure 4: it depends upon the amount of knee flexion. The more we flex the knee, the more contact there is. This is important to understand due to the concept of pressure: pressure (P) is defined as a force (F) applied over a particular area (A) or surface (for us math lovers: P = F/A). The larger the force, the larger the pressure experienced—but also, the smaller the area, the greater will be the pressure! This little formula is as complicated as this gets, and if you understand the concept of pressure, you will be able to understand why having the knee bent more in some postures will actually be better for some knees (especially if you are a student who suffers kneecap pain). FIGURE 4: Contact between the underside of the patella and the femur varies with the amount of knee flexion. At 20° of flexion, there is a small area of contact between the patella and femur. But at 135°, there is a large area of contact, which helps to reduce the pressure between the patella and the femur. When we adopt a warrior posture, the kneecap is compressed onto the femur through the contraction force of the quadriceps. The pressure experienced by the kneecap is the combination of the weight of the body above the knee and the muscular force generated by the quadriceps, divided by the area of contact between the kneecap and the femur. Let’s compare three warrior scenarios, as shown in figure 5, and see which one is generating the most pressure: a) shows a beginner version of warrior II, with a narrow stance and the knee flexed about 45°; b) shows the traditional position, with a wide stance and a knee flexion of 90°; and c) shows a variation, with the knee forward of the ankle and a knee flexion of about 115°. (This version is often frowned upon in a yoga classroom and corrected—but as we will see, it need not be always corrected!) The quadriceps are working progressively harder in each variation from a) to c), but the surface area contact between the patella and femur grows larger more rapidly than the force does. This means that position c) with the knee out over the toes actually creates less pressure between the patella and femur than position b). Version c) requires more strength in the quadriceps, so not everyone can do this version—but it is not a more dangerous position for the knee, and this may be better for students with kneecap pain. FIGURE 5: Three options for the knee in warrior II pose (virabhadrasana B): a) beginners: feet should be only wide enough to ensure that the angle of the thigh to the floor is 45° or less; b) traditional: the knee is aligned over the ankle; c) challenging: the knee is forward of the ankle, which may require the back foot being turned out and the torso leaning forward. While c) is more challenging, it may generate less pressure in the kneecap than b). Does having the knee forward of the heel in c) look scary to you? It shouldn’t, as teachers often require students to do exactly this in a different posture: chair pose! If there was a danger in having the knee forward of the ankle, how would any student ever be able to chair pose (utkatasana—shown in figure 6)? FIGURE 6: The chair pose (utkatasana): a) the version preferred in Iyengar yoga where the instruction is to make the thighs close to parallel to the floor; b) the version preferred in Ashtanga yoga where the instruction is to align the hands, shoulders, hips, and heels. 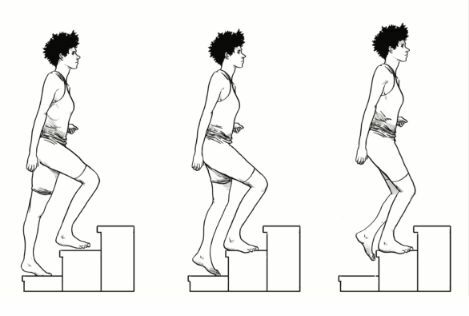 Students with flexion-intolerant back issues may be better off with option (b), while students with knee problems may do better with option (a). All too often, the alignment cue of “ensure that your knee is over your ankle” in warriors and lunges is driven by aesthetics rather than function. The reality is that for many students, it is perfectly okay for the knee to be further forward, and it may be even healthier for them—building more strength in the legs, while reducing pressure in the knee. In every chair pose, the knees must come forward to counterbalance the weight of the body going backwards. So, why is it okay (and indeed required!) for the knees to come forward of the ankles in chair pose, but forbidden in warrior poses? Aesthetics! Functionally, the knee can come forward and in chair pose, it must come forward. 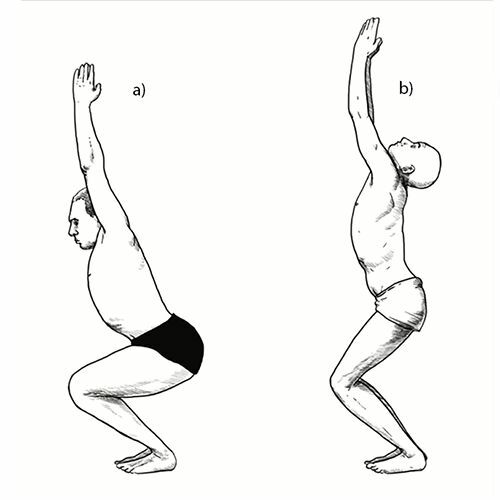 Consider the two versions of chair pose shown in figure 6: which one is correct alignment? Your answer may depend upon the yoga tradition in which you were trained. The Iyengar tradition prefers version (a), while the Ashtanga tradition prefers version (b). 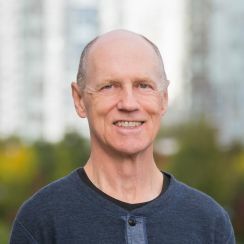 From a functional point of view, the Ashtanga tradition (with about a 90° knee bend) puts more pressure on the kneecap than the 125° knee bend of the Iyengar tradition. If someone suffers knee pain, Iyengar’s version may be safer for them. However! The Iyengar chair puts far more stress into the lower back—so for students with low back pain, the Ashtanga chair may be a healthier one to sit in. Which version is right for you depends upon your body. And while you may be able to do either one perfectly well, another student may prefer one of these chairs over the other. FIGURE 7: When we climb stairs, the knee comes forward of the ankle and the full body weight is supported on that one leg. In lunges and warriors, is it okay for your knees to be forward of the ankle, or even forward of the toes? Only you can determine the answer to that question, as it depends upon your biology and biography, as well as the intentions behind your yoga practice. But there should be no fundamental reason to be afraid to explore these alternate alignments. You will find it harder muscularly to have the knee further forward, because the quadriceps have to work harder, but there probably won’t be an increase of pressure on the kneecap. Find out what works for your body—then do your yoga.